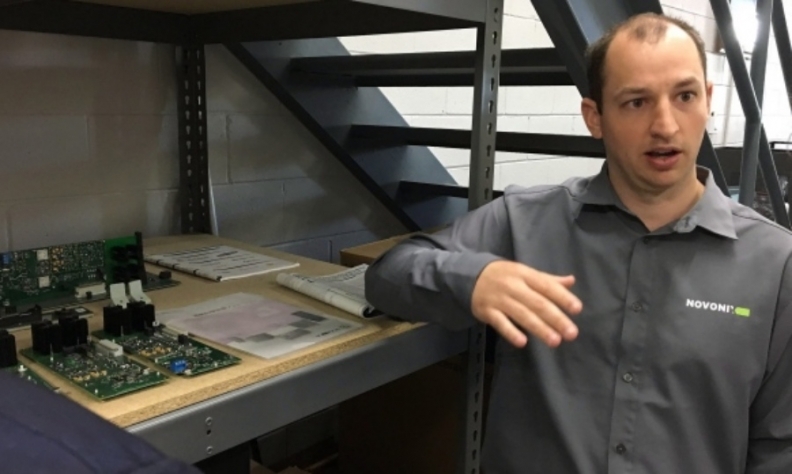 Chris Burns, president and CEO Novonix Battery Testing Services Inc., explains the company's high-precision battery testing equipment in Dartmouth, N.S. DARTMOUTH, N.S. -- The future of lithium-ion battery longevity — a key component in electric vehicles and a world without fossil fuels — may lie in an unassuming, bunker-style building in a Halifax-area industrial park. Down a concrete hall, past a ping pong table, is an airplane hangar-like room with soaring ceilings, whirring electronic equipment and a massive loading door flung open to the harbour air. This is the office of Novonix Battery Testing Services, a Dartmouth company honing high-precision battery testing systems for tech firms including Tesla Motors and Apple. The start-up was spun off from Herzberg Medal-winner Jeff Dahn's ground-breaking battery lab at Dalhousie University. Australia's publicly traded Novonix Group bought a majority stake in June, and the company is now ramping up efforts to grow its customer base. With the help of a $500,000 loan from the Atlantic Canada Opportunities Agency announced Tuesday, Novonix plans to move to a larger facility in Bedford, add to its eight-person team and expand equipment sales and testing services. Demand for high-powered, long-lasting lithium-ion batteries is expected to soar as restrictions on gasoline- and diesel-fuelled vehicles mount and renewable energy-storage needs increase. Testing and lengthening the life expectancy of the rechargeable batteries will become an increasingly critical component to research and development. In what could be a giant step for the firm's lithium-ion battery testing capabilities, Dahn, who has teamed up with Tesla, the California electric car and solar panel company headed by CEO Elon Musk, has also assigned a new patent to Novonix. "It's very hard to make a lithium-ion cell that lasts a long time," says Dr. Chris Burns, Novonix president and CEO. "It's even harder to prove it." The powerful rechargeable batteries fuel everything from electric vehicles and cellphones to laptops and vacuums. They're even being used in grid-energy storage projects. Traditional methods of testing the lifetime of a lithium-ion battery can take months or even years. But Novonix has narrowed down the testing period to weeks. "We developed and commercialized a system that is more accurate than what anyone else is building in the market and that allowed researchers to gain insight into the performance of their batteries in only a few weeks what through traditional methods might take months or years," Burns says. The 30-year-old, originally from outside Boston, came to Halifax in 2009 to attend Dalhousie University. Largely through word-of-mouth, Novonix now has amassed an impressive roster of marquee clients including Panasonic, Dyson, Bosch and 3M. "We go to conferences and trade shows and Jeff Dahn mentions us," Burns says. "It's a small industry and people hear about us and that has kept us very busy." "Jeff gets paid a Corona every six months," Burns jokes. Using high-tech electronics, Novonix measures coulombic efficiency to determine how small changes in rechargeable lithium-ion battery chemistry will impact long-term battery performance. The company uses local suppliers to build its equipment. The metal work comes from Protocase in Cape Breton while the board assembly is done by Sunsel Systems in Dartmouth. Novonix plans to expand its equipment offering soon to include the latest intellectual property to come out of Dahn's lab. Although estimating the remaining life in a lithium-ion battery is difficult, Dahn says he noticed that as lithium-ion batteries age, the liquid electrolyte in the cells slowly turns into a solid form. "When the liquid is gone, the batteries are dead," he says. "So if you can determine the fraction of liquid that remains in the battery, you can estimate the state of health of the battery and how much longer it might last." With the help of a student researcher, Dahn developed a so-called "lithium-ion battery differential thermal analyzer." "It's a huge mouthful," he said. "But it's actually a very simple method. Batteries are frozen and slowly heated to detect when the liquid electrolyte melts. The strength of the signal is related to how much liquid is remaining and to its composition."